I have the sweetest daughter. See what she sent me? Isn’t it beautiful? 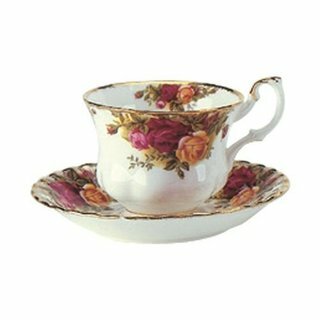 I had mentioned that I would like to collect a few assorted teacup and saucer sets, then I could hold a sort of shabby chic tea party. Already have a couple of tea pots I can use. 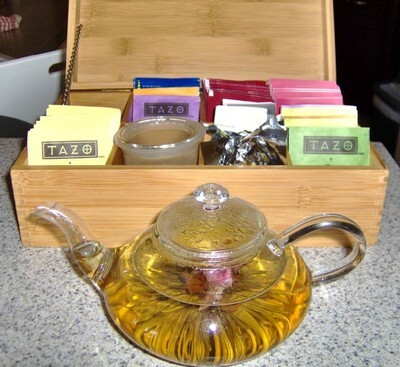 For Christmas last year my son and his wife gave me a bamboo tea chest and a clear teapot to use with the tea posies I received from a friend. I’ve been promising to show a picture of the teapot with a tea posy and never got around to it. So today I had my own little tea party with tea posy tea drank from my new teacup set. It’s hard to get a good picture of the posy inside the teapot. I’m still sorting through and editing the 47 pictures I took at retreat, hope to post them soon. Dad was put back on the ventilator but his white count is still going down. So even though there has been a setback he is still showing improvement. Now I need to get rid of this crappy cough so I can go up to the hospital for a visit. They frown on visitors coughing in ICU. I have lots of pictures from Skrappy Ladies Retreat, so hopefully I will soon have a post complete with embarrassing, blackmail pics and details. The bluebird of happiness has visited. Dad is improving a lot, will probably be in the hospital at least another two weeks, but he’s making a lot of progress. 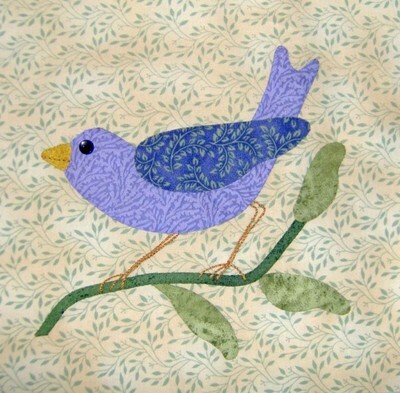 Instead of making some small pieced blocks for Colleen’s Progressive Challenge blocks, I decided to do more applique. A bird block. Since Dad is doing better I will be able to go to Skrappy Ladies Spring Retreat in the canyon. There will be much laughter, talking, eating and maybe even a little work on our quilt projects. Also the much anticipated “reveal” of everyone’s progressive challenge blocks. I’m planning to take lots of pictures. And now……here is the above mentioned bird. Thank you to everyone for the supportive emails, comments and prayers while Dad is ill. It will probably be pretty quiet around here for a while. My Dad is in the hospital and has been for almost 2 weeks. It started with what they thought was pneumonia and progressed to they’re not sure what. They are running tests and doing procedures and hopefully we will know something soon. I’m not even getting much knitting done. Occasional work on the “WHY?” project, only because it’s just good old knit stitches with the occasional slip stitch. Haven’t done a quiz in a while and found this one on another blog. For the most part this describes me fairly well. Not sure I like the idea that if people don’t “get” me, that they would think I’m incompetent. You enjoy spending your free time in nature, and you are good with animals and children. Simply put, you enjoy beauty in all its forms and live for the simple pleasures in life. Gentle, sensitive, and compassionate – you are good at recognizing people’s unspoken needs. You have an underlying love for all living things, and it’s easy for you to accept someone into your heart. I’ve been knitting on a “Why?” project using a stash yarn bought on sale a few years ago. I’ll post more about it later, when I’m further along. Haven’t done much in the quilting area. Mostly just trying to decide which of the many UFO’s I want to work on at retreat in a couple of weeks. Skrappies decided that instead of starting on something new, that we would bring unfinished projects to work on. The garden is planted, at least as much as can be planted until the onions are harvested. We have 3 Roma tomatoes, 2 Bell Pepper’s, 2 Eggplant’s, 2 Jalapeno’s and an Heirloom Yellow Pear Tomato. From seed I have, Summerlong Basil, Cantaloupe and some (for front flowerbed) Red Hot Pokers that will be ready to set out soon. Surprisingly all of my herbs survived the winter, even the Italian Parsley and Salad Burnet. I pulled the Salad Burnet up because it was a monster and crowding out everything else. All of the Burnet I’ve had before went to seed at the end of the season and died. I don’t think this one got the memo. My Dad is in the hospital and if the test they are running today comes back negative he will be released. So we are waiting for a call so Bill can go to take him home. Edit: I discovered that Salad Burnet can overwinter in certain climates and can be a perennial. Strange that I’ve never had this occur before, since when I’ve grown it before, we were living in a slightly warmer climate south of here. Yesterday I was faced with three bananas that were headed south at an extremely rapid rate. What to do? Wasn’t really in the mood for banana bread. Muffins sounded better. But I didn’t have a banana muffin recipe. After searching a few recipe sites and not finding exactly what I wanted, I decided to take parts from several different versions. The results were great. The muffins are moist, have good banana flavor and aren’t extremely sweet. They tasted even better this morning than they did yesterday. As a child I was always taught to share, so here is my improvised recipe. Mix together the mashed bananas, sugar, egg, vanilla and margarine. In a separate bowl stir together the baking soda, baking powder, salt and the flour. Combine the wet and dry ingredients, be careful not to over mix. Fold in the nuts. Pour into greased muffin tin and bake at 350º F. for 20 to 25 min. Muffins are done when a toothpick inserted in the center of muffin comes out clean. Makes about 12 muffins. Note: I had a partial bag of chopped pecans, that wasn’t really old but had been around for a while. To freshen them up I toasted in the 350º for 10 minutes. Then let them cool while I mixed the muffin batter. Believe me when I say that toasting the pecans first really adds to the flavor of the muffins and your pecans don’t get soft during baking. A visit, the plague and finishing. Last week was a rollercoaster. Lots of ups and downs. Kerry came for a visit and spent the night. She brought along our Girl Scout cookie order so we are now well supplied with sweet treats. Then Friday morning I woke up with, thankfully, a mild case of whatever is going around. Friday and Saturday were spent bundled up in my chair sleeping, watching TV and movies. Which means that I didn’t make it to the Iron Thistle Scottish Heritage Festival. I was really in the mood for bagpipes and men in kilts, too. A couple of things I’ve been working on were finished. First is another block for Colleen. This is the one with the fantasy flowers and the insanity induced polka dots. 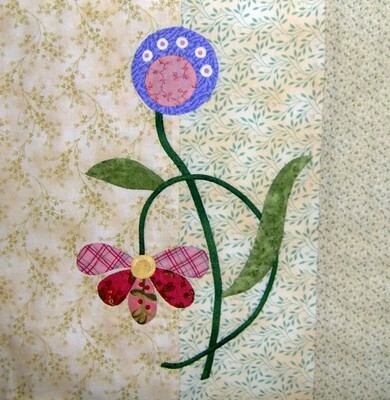 I’ll be making several small simple pieced blocks and then will be finished with my part of the Progressive Challenge. 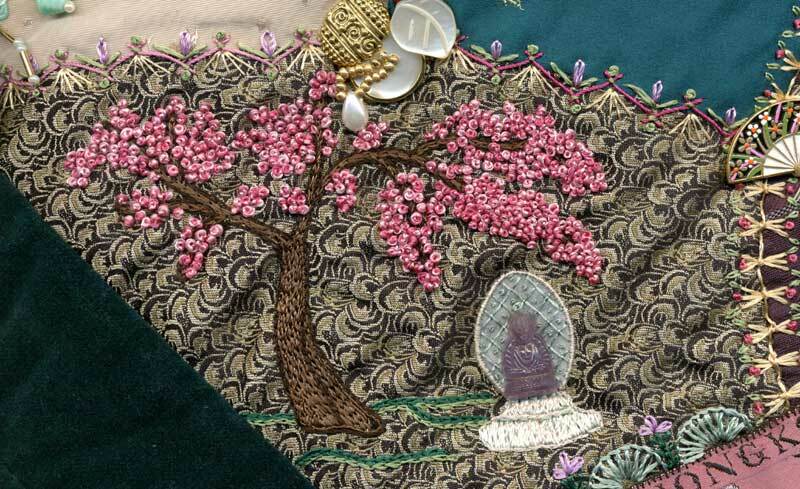 Everyone’s blocks will be unveiled at our Skrappy Ladies Spring Retreat later this month. I’m looking forward to spending the weekend with good friends and seeing all of the challenge blocks. A knitting project was also finished. 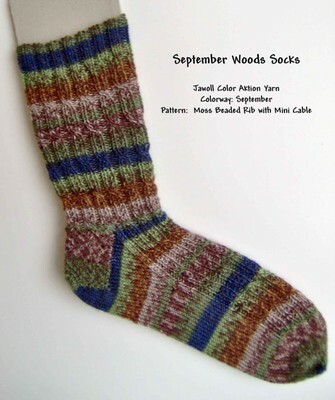 The September Woods Socks are now complete. The final, keeping fingers crossed, stepdown on the Prednisone withdrawal has begun. The brain is feeling slightly foggy and having a little shortness of breath, hopefully it won’t last long.